The Duke’s full name was John George Vanderbilt Henry Spencer-Churchill. 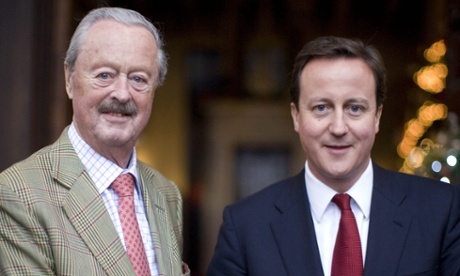 David Cameron paid tribute, saying: “I am greatly saddened to hear of the death of the Duke of Marlborough. To me, he was not only the vice-president of my association but also a good man and friend. “His grace will be deeply missed by all those he worked alongside at Blenheim and by the town of Woodstock where he played such a positive and active role in the community he loved. The Duke was a cousin of Winston Churchill, who was his godfather, and he was also distantly related to the late Princess Diana. His death means his once-troubled son Jamie Blandford, currently known as the Marquess of Blandford, will inherit his father’s title and become the 12th Duke of Marlborough. A Blenheim Palace spokesman said he was unable to comment on whether the marquess will inherit the palace estate, which is worth around £100m. The palace in Oxfordshire was built in the early 18th century in the opulent baroque style. The birthplace of Churchill, the 4,800 hectare (12,000 acres) estate has 187 rooms, dwarfing Buckingham Palace and Windsor Castle. The palace was built as a gift to the 1st Duke of Marlborough, John Churchill, as a reward for his military triumphs against the French and Bavarians during the war of the Spanish succession. The duke had been married four times and has four surviving children – two from his first marriage to Susan Hornby of the WH Smith dynasty, and two from his third marriage to Rosita Spencer-Churchill. In 2008 he married his fourth wife, Lily Sahni, the daughter of a successful Indian businessman, who was more than 30 years the Duke’s junior. The marquess spent much of the early 1990s in newspaper headlines because of his drug addiction. He spent several spells in prison for a string of driving offences, causing some to dub him “the wayward peer”, and was publicly estranged from his father. 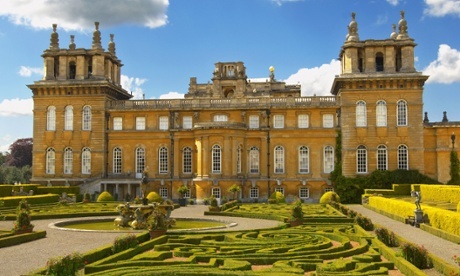 In a bid to safeguard the Blenheim Palace estate from the Marquess’s excessive behaviour, his father won a court battle in 1994 to ensure he never won control of the family seat. The marquess has a long history of skirmishes with the law. In 1983 he was fined for assaulting a police officer, and the following year he was sentenced to three months imprisonment for breach of probation. He was put on probation again in 1985 and fined 1,000 for breaking into a chemist’s shop and in 1986 he was convicted of drug offences. At that time he admitted spending £20,000 on cocaine in four months. From the late 1980s into the early 1990s he chalked up a record of motoring offences and was repeatedly banned from driving. In May 1994 he was remanded in custody for three weeks in HMP Brixton after failing to keep appointments with probation officers, and the following month he was put on probation for 18 months and ordered to attend a clinic for drug addiction. In December 1999 he was rushed to hospital with a missing eyelid, a badly damaged nose, three missing teeth and a broken shoulder after a car ran into his Toyota Land Cruiser in Kiddington, Oxfordshire. But he reformed his behaviour and in 2012 he featured in a Channel 4 documentary which charted his new relationship with his father. In a preview for the show, the Daily Mail quoted the late duke saying: “I am fully confident that James will be able to keep this place [Blenheim Palace] going. But over the top of him, and over the top of me, are trustees. “You can’t predict the future. You never know, God forbid, whether you would get behind the problems again but things are looking much more settled at the moment.